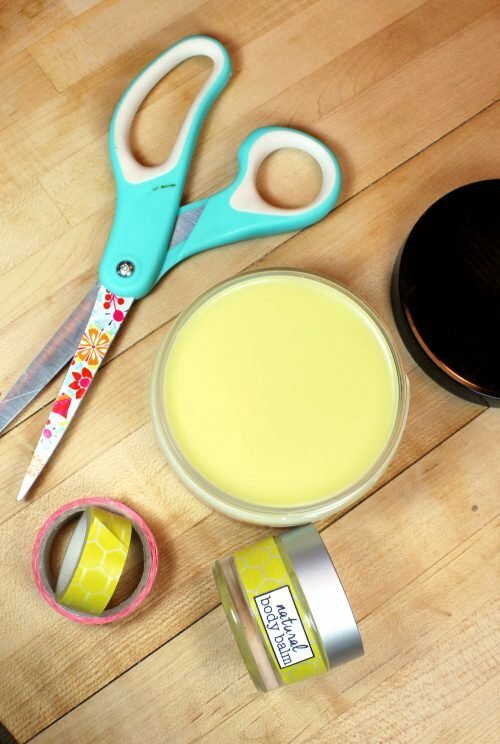 This homemade salve recipe for the best scar and stretch mark treatment from guest poster Cari Dunn of Everything Pretty will teach you how to easily create a homemade salve that can help fade dark spots and promote cellular turnover. Our scars tell a story. Whether you fell as a child, cut your finger while cooking a holiday dinner, or otherwise hurt your skin, each mark has a story. If you have stretch marks from children, then you have a lot of stories to tell about those marks. Even though our scars are a part of our history, we don’t have to like them. 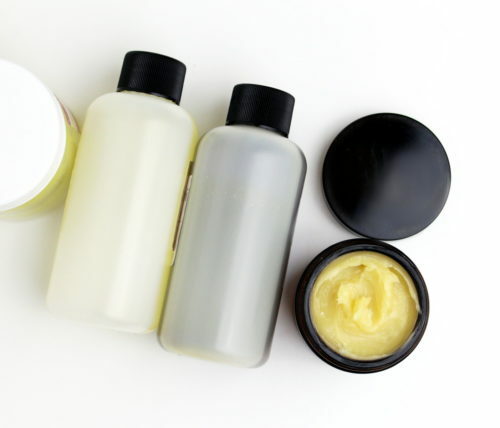 Unfortunately, plastic surgery might be the only way to get rid of some scars, but there are natural products that you can make to help reduce scars and make them appear less noticeable. 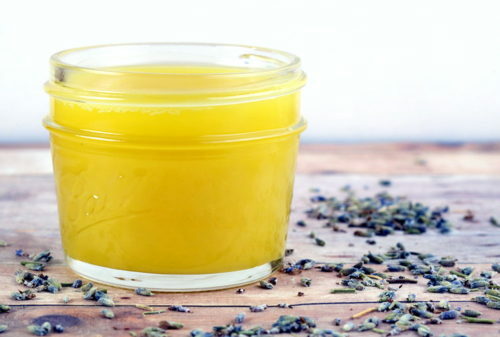 This homemade salve recipe for the best scar and stretch mark treatment is one of those ways. 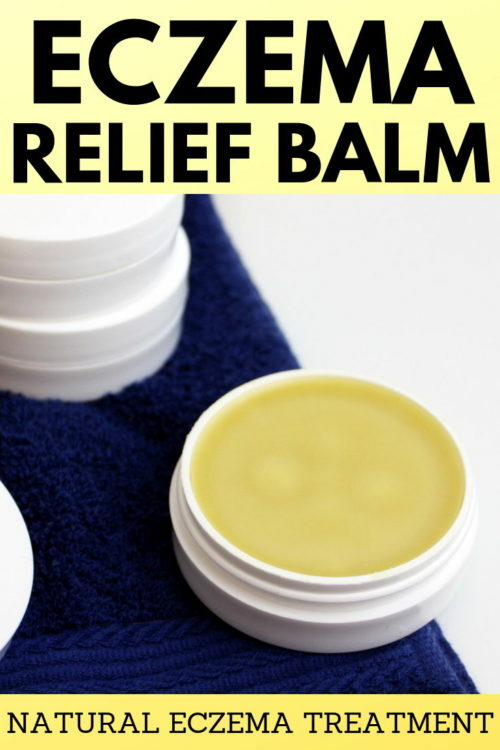 You shouldn’t use this salve for the best scar and stretch mark treatment on broken or injured skin. 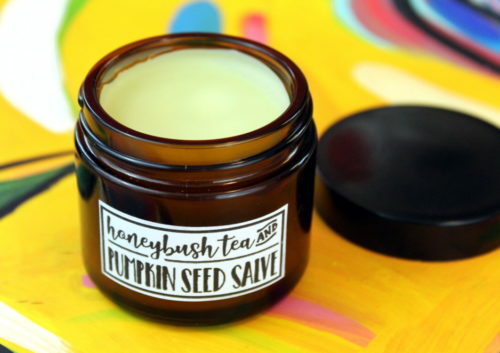 Wait until your skin has healed to where you don’t have an open wound before you use this salve. Fresh scars are easier to fade than old scars. If you have an old scar, you may not get results for three to six months with daily use. For best results, use this best scar and stretch mark treatment salve with my scar and stretch mark sugar scrub. You should use the scrub three times a week and use the natural homemade salve twice a day. 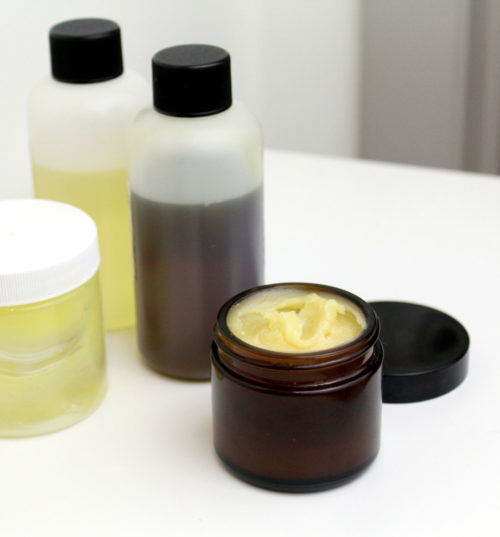 For this homemade salve recipe for the best scar and stretch mark treatment, I wanted to use several carrier oils as they each have their own skin care benefits. You don’t have to use the same oils that I used, but I do recommend using at least two of them plus the vitamin E oil. Whatever you decide to use, use the same amount of oil or the recipe won’t turn out right. Rosehip seed oil is probably the most popular carrier oil for scars making it one of the key ingredients in this best scar and stretch mark treatment. 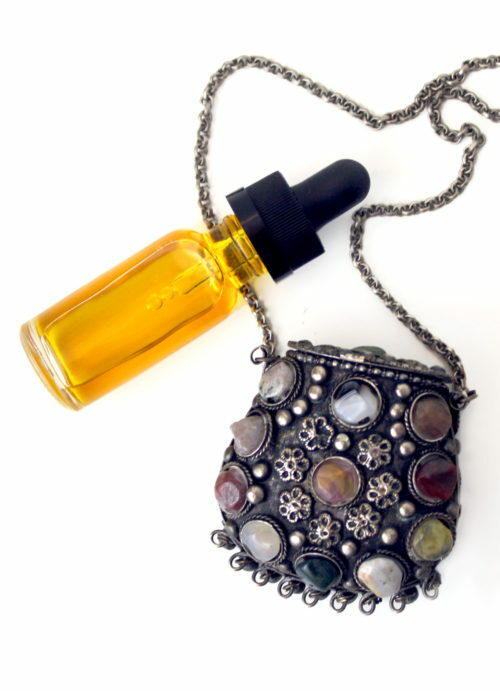 This oil is extracted from the seed pod or the petals of the rose plant. 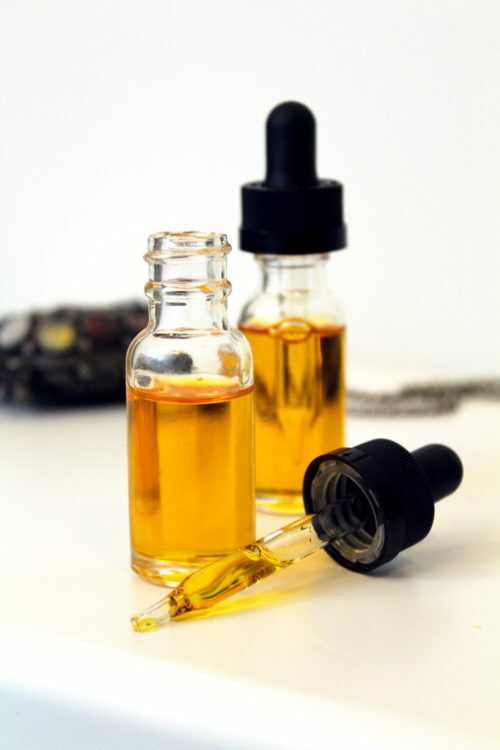 The resulting oil is high in fatty acids and vitamins that make it a great oil for your skin. 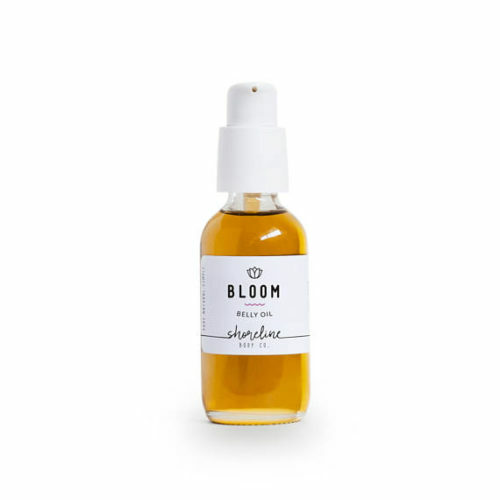 Rosehip oil is a dry oil, which means that absorbs quickly into your skin. The oil has vitamin A, retinol, a natural way to treat fine lines and wrinkles. The vitamin A helps promote cellular turnover so skin can heal. Rosehip seed oil works so well on scars due to the linolenic acid, omega-3, and omega-6 fatty acids. Rosehip seed oil is said help reduce redness and pigmentation, which can help make scars less noticeable. The fatty acids and vitamins in it have also been said to fade scars and prevent the formation of keloid scars. It is important to note that rosehip seed oil can increase your sensitivity to the sun, so always wear sunscreen if you use this salve before you go outside. 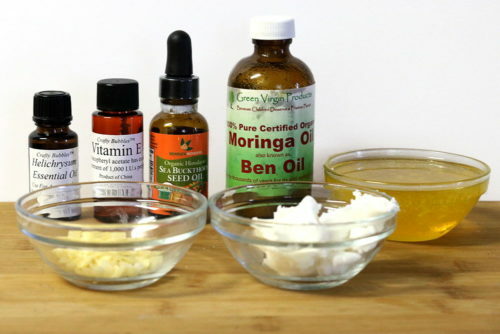 I also used moringa oil, which is sometimes called ben oil. Moringa oil is high in oleic acid, omega-3, and omega-6 fatty acids. It’s high in vitamin E, a natural antioxidant. Moringa oil has many benefits for the skin. It’s naturally anti-inflammatory, an antioxidant, and naturally antimicrobial. 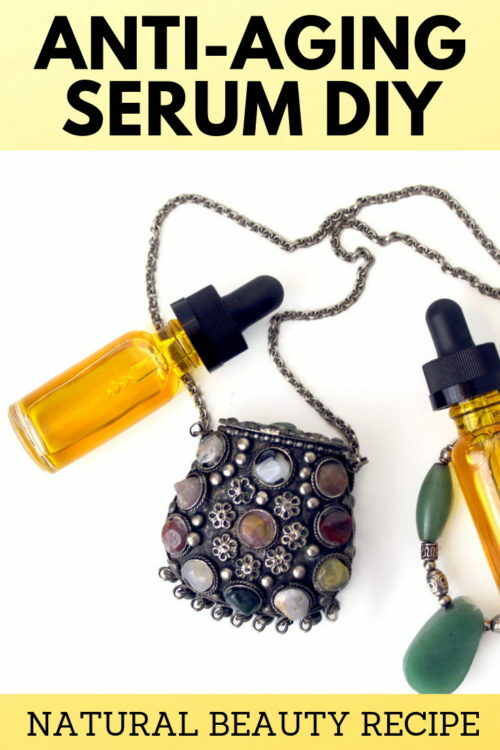 Another benefit to using this oil is that it naturally exfoliates dead skin cells. It’s also a dry oil, so it absorbs quickly. For the third oil, I used sea buckthorn oil. It’s high in vitamin E, which can help boost skin healing. It’s high in omega-7 fatty acids, palmitoleic acid, which is rare in carrier oils. The oil is said to boost cellular turnover and boost your skin’s ability to heal, which is perfect for treating scars making it another must have ingredient for this best scar and stretch mark treatment. It’s also a dry oil, so it soaks into your skin and goes deep to moisturize. To learn more about different carrier oils and their benefits, check out my book Carrier Oils: A beginner’s guide to using over 40 carrier oils in bath and body recipes. Even though the oils are all natural sources of vitamin E, I wanted to add more of the oil because it’s a wonderful oil for your skin. Vitamin E is an antioxidant, so it can protect your skin from free radicals. It also acts like a natural preservative. Since it’s an antioxidant, it can preserve the shelf life of carrier oils. The recipe for my best scar and stretch mark treatment doesn’t have water in it, so it doesn’t need a preservative like you would need in a lotion with water. However, the oils can go rancid. Vitamin E helps keep the oils from going rancid. 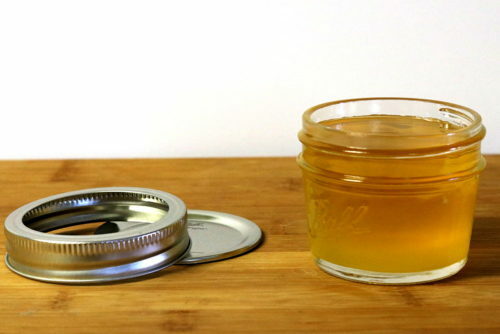 Beeswax is obviously hard at room temperature, so it’s used to harden this recipe to turn it into a salve. But beeswax has several benefits for the skin beyond thickening this bes scar and stretch mark treatment recipe. 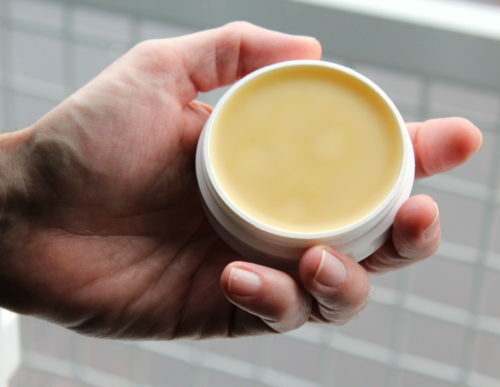 When applied topically, beeswax forms a protective layer on top of the skin. It traps the oils on your skin, so they can work to help heal your skin. 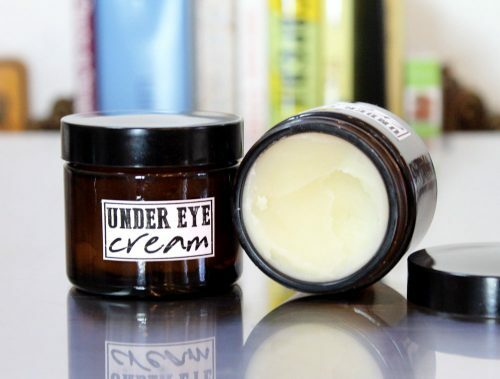 Some creams and salves use petroleum based products, but these can clog the pores and don’t allow any air to flow through. Beeswax forms a barrier, but it can still allow air to flow. Beeswax also works on healing skin because it’s a humectant. It attracts water molecules from the air, pulling them to your skin. This helps keep the skin moisturized and hydrated over time. The vitamin A found in beeswax can help exfoliate the skin. Shea butter is one of my favorite butters to use for skin care products because it’s not oily and has a lot of skin loving benefits. Shea butter is what’s known as an emollient. It penetrates the skin and seals the top layer. This traps moisture against your skin. It’s also high in vitamin A. Vitamin A is important to promote collagen production and reduce dark spots on the skin, including those from scar. 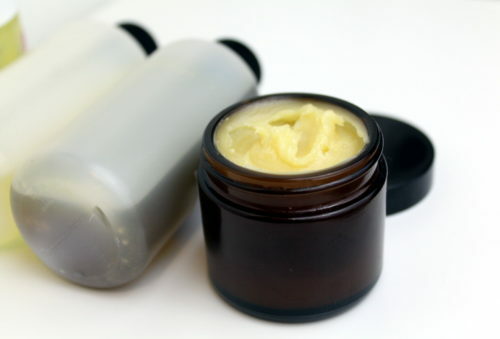 High in antioxidants and vitamins, shea butter is one of the best butters to use on scars. It moisturizes, protects, and hydrates the skin so it can repair itself. There are actually four types of helichrysum, but I used Helichrysum italicum. It’s extracted from a Mediterranean plant, a flower that’s close to the daisy. Like chamomile, it’s a gentle oil that’s great for sensitive skin or, in this case, skin that has scars. 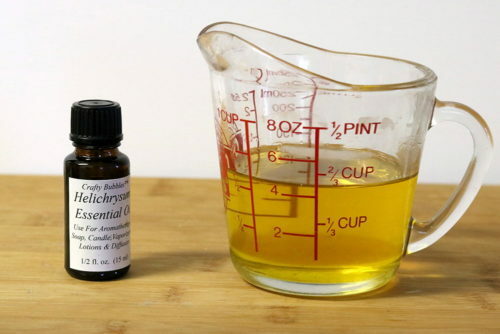 Helichrysum essential oil doesn’t leave your skin oily, but it does moisturize your skin. It can also fade dark spots on your skin, including hyperpigmentation due to scars. 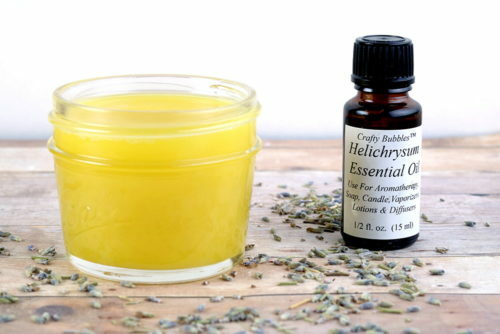 Lavender essential oil is a popular essential oil that’s used in many different skin care recipes. It’s a gentle oil, so it’s safe to use on scars. Ready to make my natural skin care recipe for the best scar and stretch mark treatment? Great! Here’s how it’s done. 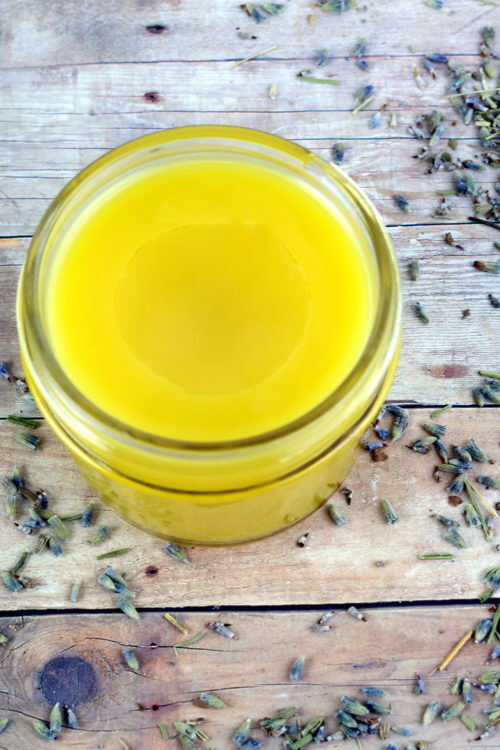 Gather all of the ingredients called for in my natural homemade salve recipe for the best scar and stretch mark treatment. Using measuring spoons, combine rosehip seed oil, moringa oil, sea buckthorn oil, vitamin E oil, beeswax, and shea butter in a heat proof glass container. I use a 2 cup Pyrex measuring cup. Set the container on canning jar rings in a medium sized pan. Carefully add water to the pan to cover the oils. Be careful not to get water in the measuring cup. Heat on medium until the beeswax and shea butter is melted, stirring occasionally. Carefully remove from heat. Let cool until no longer steaming. Pour into a 4-ounce mason jar. I made a full 4-ounce mason jar with a little left over. I keep small souffle cups on hand to pour a little in. These are perfect for keeping in my purse or giving to friends and family. For best results, use this scar and stretch mark salve with my scar and stretch mark sugar scrub. More Skin Care Recipes to Try Right Now! If you liked my recipe for the best scar and stretch mark treatment, then check out the following posts for more DIY skin care recipes! Not Ready to DIY It? Buy It Instead! Not quite ready to recreate the recipe for my best scar and stretch mark treatment? Buy one of these homemade versions instead! 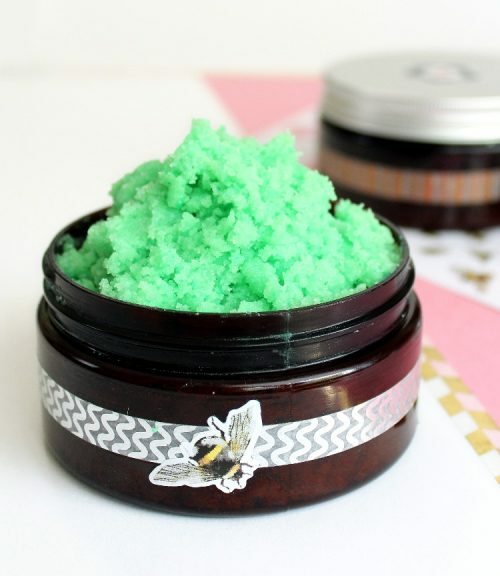 This moisturizing sugar scrub recipe is formulated for exceptionally dry skin. 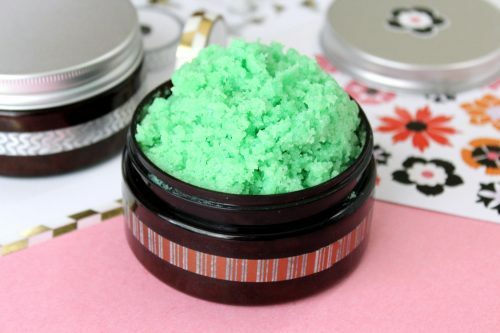 Made using luxurious and richly hydrating moringa oil and skin soothing oat butter, this moisturizing sugar scrub can help to calm and soothe dry, itchy skin and inflammation. And it’s scented with a jackfruit & kiwi fragrance oil for a to-die-for tropical fruit fragrance that’s perfect for summer. Moringa oil is a nutrient dense, extremely moisturizing carrier oil that is rich in vitamins A, C and E. It also has antiseptic and anti-inflammatory properties. In addition, moringa oil has been shown to help promote healing when fighting bothersome skin conditions such as skin dermatitis, eczema and psoriasis. It can also help to fight the effects of aging by minimizing the appearance of fine lines and wrinkles. Oat Butter is a soothing blend of oat oil and hydrogenated vegetable oil. When added to lotions, creams, and body butters, this ingredient helps to give the final product an extra rich, luxurious feel. Somewhat softer than shea butter, oat butter makes a wonderful addition to products formulated for sensitive skin. 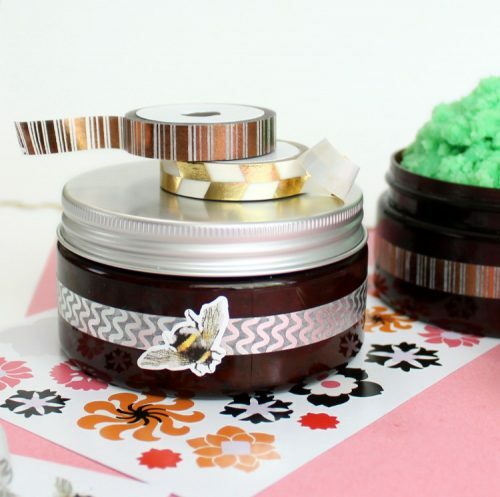 Ready to give this amazing moisturizing sugar scrub recipe a try? 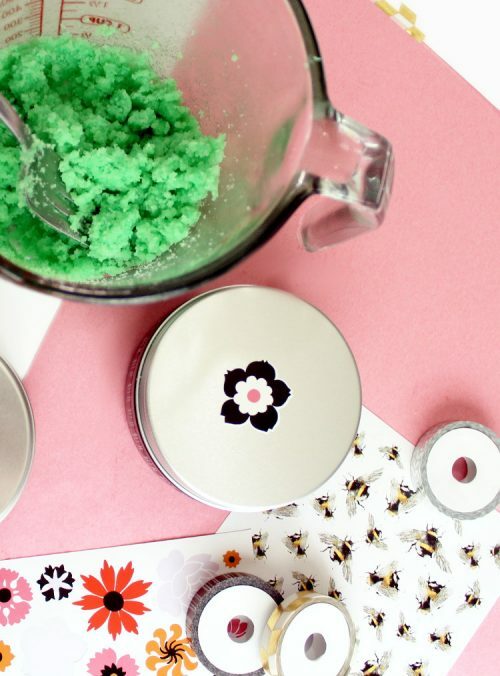 Find the recipe below along with some super simple ideas for decorating your sugar scrub containers! My Jackfruit & Kiwi moisturizing sugar scrub recipe yields three 8 oz. sugar scrubs. Using a digital scale, weigh out the cocoa butter and emulsifying wax into a large glass Pyrex measuring cup or similar. Heat in a microwave at 50% power until melted. (Alternately you can also use a double boiler.) Remove from heat. 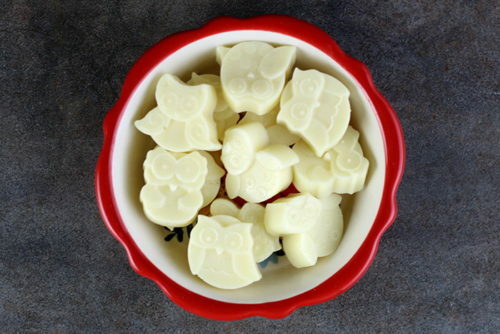 Next, weigh out the oat butter and stir it into the melted wax and cocoa butter until melted. 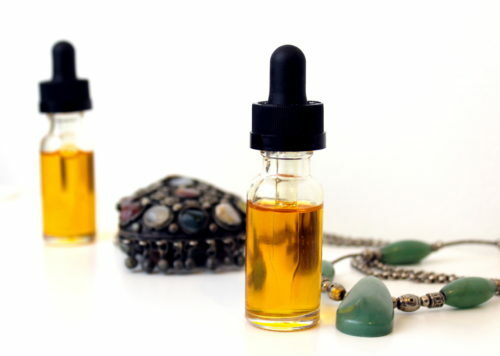 Weigh and follow with the sweet almond oil and the moringa oil. Mix well. Now weigh out the fragrance oil and stir into the moisturizing sugar scrub mixture. Set aside. In a separate container weigh out and combine the sugar, jojoba beads and the mica powder. Whisk well with a fork until all of the ingredients are fully incorporated. Now pour the dry ingredients into the liquid ingredients. Mix well with a fork until the wet and dry ingredients are fully incorporated with one another. 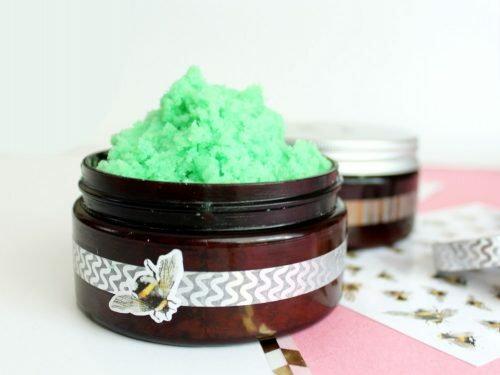 Allow your moisturizing sugar scrub to cool slightly then remix. Continue until no more oil rises to the top of the scrub. 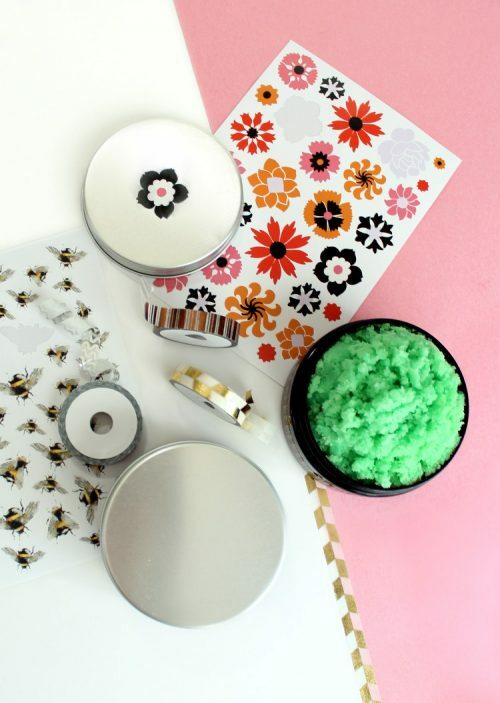 If desired, you can decorate your moisturizing sugar scrub containers. 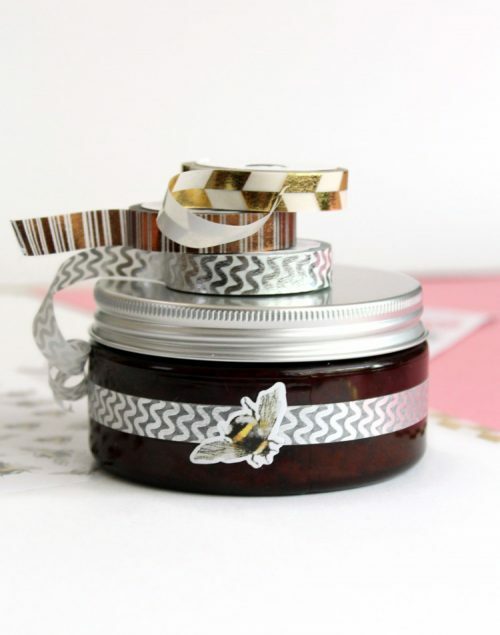 For my containers I used a strip of the Hand Made Modern Mixed Metallics Washi Tape around the amber jars. 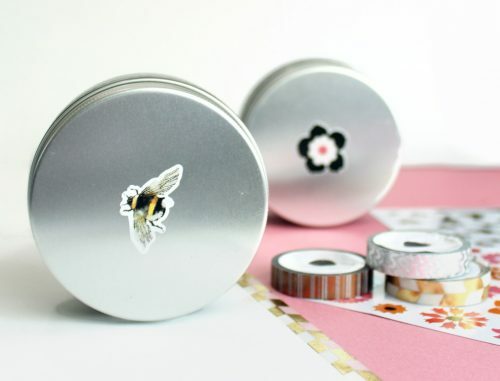 I then added bee and flower stickers from the Victoria Beckham for Target Sticker Book over the washi tape and on the lids. If you prefer instead to sell your moisturizing sugar scrubs, then you will need to label them according to FDA guidelines. If you are unsure about labeling laws then I highly recommend the book, Soap and Cosmetic Labeling: How to Follow the Rules and Regs Explained in Plain English, by Marie Gale. You may also want to consider using a preservative such as Optiphen. 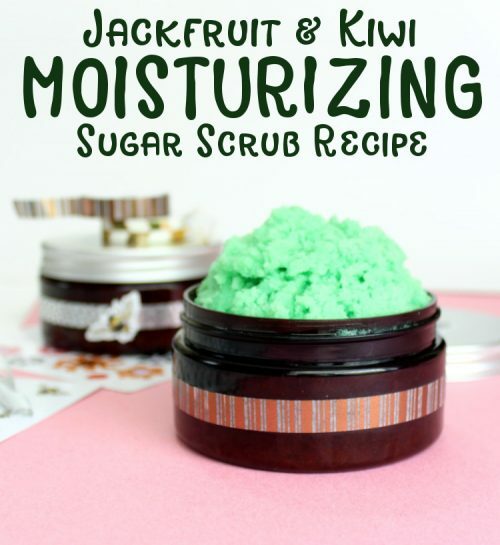 If you liked my Jackfruit & Kiwi moisturizing sugar scrub recipe, then you may also like my cucumber mint sugar scrub recipe and my summer blueberry sugar scrub recipe. 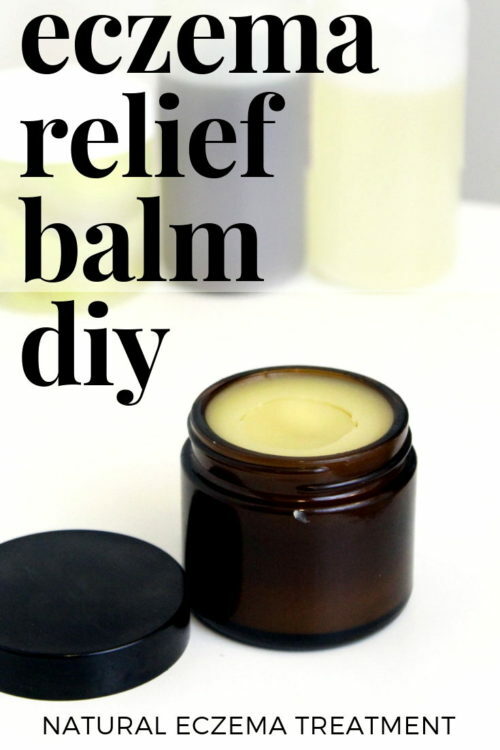 Or, for dry skin, give my natural rose body balm recipe or my palmarosa lime natural body balm recipe a try! For more homemade bath and body recipes, be sure to check out and follow my DIY Bath and Body Pinterest board. You can also find and follow me on G+, Tumblr, Facebook, Twitter, Blog Lovin’, and Instagram. Or sign up to receive new posts from Soap Deli News blog to your email via FeedBurner so you never miss a post.